As I came home from the market and prepared to turn into the driveway I had to stop for an obstacle: a bullsnake who had stretched himself across the road. I pulled off, got out of the car and ran back. A pickup truck was coming around the bend and I was afraid he would run over the snake, but he stopped and rolled down the window to help. White Rock people are like that, even the ones in pickup trucks. I tried to loom in front of him and stamp on the ground to herd him off the road, but he wasn't having any of it. He just kept coiling and hissing, and struck at me when I got a little closer. I moved my hand slowly around behind his head and gently took hold of his neck -- like what you see people do with rattlesnakes, though I'd never try that with a venomous snake without a lot of practice and training. With a bullsnake, even if they bite you it's not a big deal. 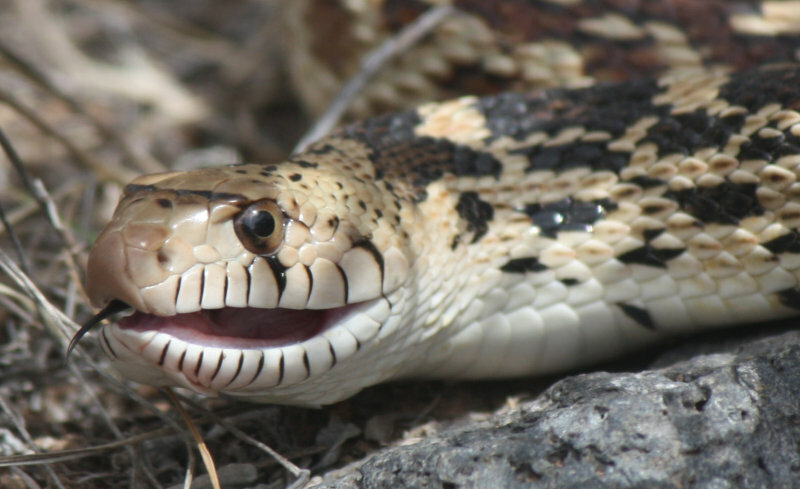 When I was a teenager I had a pet gopher snake (a fringe benefit of having a mother who worked on wildlife documentaries), and though "Goph" was quite tame, he once accidentally bit me when I was replacing his water dish after feeding him and he mistook my hand for a mouse. (He seemed acutely embarrassed, if such an emotion can be attributed to a reptile; he let go immediately and retreated to sulk in the far corner of his aquarium.) Anyway, it didn't hurt; their teeth are tiny and incredibly sharp, and it feels like the pinprick from a finger blood test at the doctor's office. Anyway, the bullsnake today didn't bite. But after I moved him off the road to a nice warm basalt rock in the yard, he stayed agitated, hissing loudly, coiling and beating his tail to mimic a rattlesnake. He didn't look like he was going to run and hide any time soon, so I ran inside to grab a camera. In the photos, I thought it was interesting how he held his mouth when he hisses. Dave thought it looked like W.C. Fields. 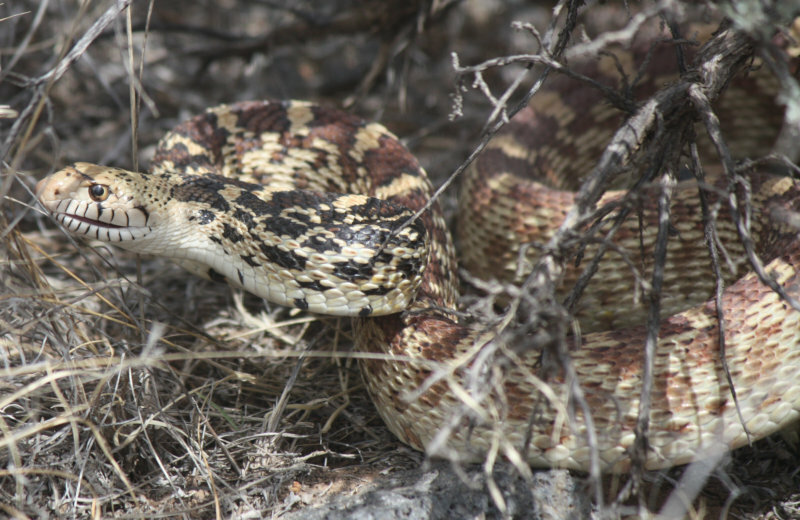 I hadn't had a chance to see that up close before: my pet snake never had occasion to hiss, and I haven't often seen wild bullsnakes be so pugnacious either -- certainly not for long enough that I've been able to photograph it. You can also see how he puffs up his neck. I now have a new appreciation of the term "hissy fit".